In the first full-length study in any modern language dedicated to the Meteorologica, Malcolm Wilson presents a groundbreaking interpretation of Aristotle's natural philosophy. Divided into two parts, the book first addresses general philosophical and scientific issues by placing the treatise in a diachronic frame comprising Aristotle's predecessors and in a synchronic frame comprising his other physical works. It argues that Aristotle thought of meteorological phenomena as intermediary or 'dualizing' between the cosmos as a whole and the manifold world of terrestrial animals. Engaging with the best current literature on Aristotle's theories of science and metaphysics, Wilson focuses on issues of aetiology, teleology and the structure and unity of science. 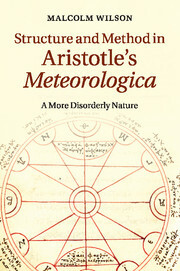 The second half of the book illustrates Aristotle's principal concerns in a section-by-section treatment of the meteorological phenomena and provides solutions to many of the problems that have been raised since the time of the ancient commentators.